Download includes "the Prejudices of History"- a PDF brochure of explanatory notes and photographs by Mark Browne. Numbered edition of 30 hand-stamped CDRs in a wrap-around mini-dvd case. Each also includes a unique photograph of Mark Browne's burnt piano, backed by a piece of a colourful Jamaican shirt, and a business card. 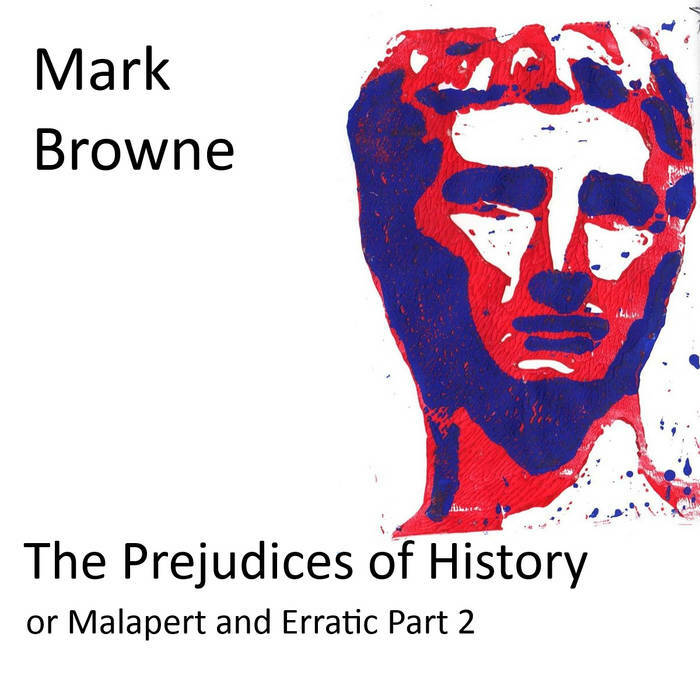 Includes unlimited streaming of The Prejudices of History via the free Bandcamp app, plus high-quality download in MP3, FLAC and more. 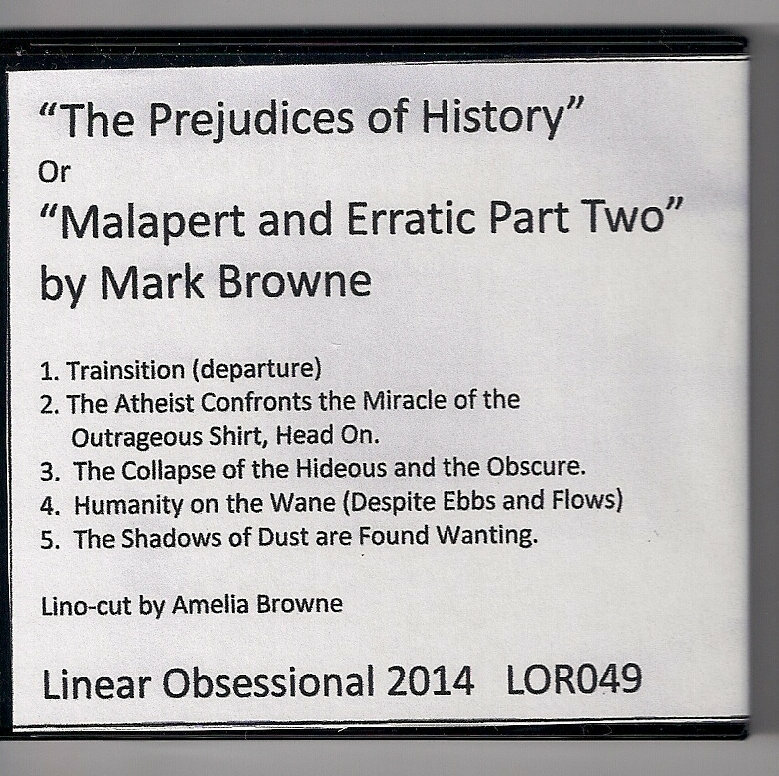 Linear Obsessional is delighted to present this new EP by Mark Browne. It is released simultaneously with Chris Whitehead's "Habitats for Metal Plants" with which it shares some concerns. Over the years I have become increasingly aware of what I do as a musician and the need to at least appear to conform to some ideal whether real or imaginary. This may be an attempt to answer the question: What epitaph will adorn my headstone? It has been documented that I play the saxophone, and indeed this has been the case for around 30years. The problem comes with the definition of saxophonist. For me picking up a saxophone, alto initially, was required in an effort to undo the learning that I had acquired over several years of classical guitar playing. The guitar still has the feeling of being someone else’s territory and I could not see myself developing in a manner that would create an approach and style that I could call my own. The uniqueness of a musician’s approach struck me as being important at that time, aged 16. And so the saxophone was selected as my new instrument: its methods and approach being the antithesis of those of the guitar. Looking at some notes from this period it seems that I believed the ideal piece of music (naturally an improvisation) should aspire to infinite variation in dynamics, timbre and colouration, and rhythm. In later years the need for and development of form (rhythm in a wider sense) has become more important. So the saxophone is not a guitar. Neither are many other instruments. Am I a saxophonist? Am I a percussionist? Probably neither, I am a collector of sound making devices – the saxophone, in a single instrument, fulfils a number of those early requirements. The other instruments are used to augment the repertoire, adding contrast to the saxophone and expanding the music’s soundscape. As well as a collector, I am an arranger of sounds and occasional organiser of people. Nothing more. "And now it’s time for a different kind of Mark: Mark Browne! He delivers quite an odd release that I feel very pleased to share with you. Let me tell you about the tracks that it contains. Trainsition (departure) sounds like Mark Browne is having fun playing a mouth harp and a (probably) stolen carillon bell from a local church. It’s a bit weird but it works out well. Than Mark Browne goes forward with more eccentric stuff in a track he called ‘The Atheist Confronts The Miracle of the Outrageous Shirt, Head On’. It sounds like Mark is enjoying himself with things to rattle, plastic things, wooden pedals, a bottle? Only Mark Browne knows its secret instruments used in this recording, but the result is easy and listenable. It is a nice background for Mark Browne attempting to sound like an elephant calling another elephant around mating season. He blows his horn or whales it out between his lips, whatever he uses it doesn’t sound close to a real elephants call, but that’s a good thing; making it a very interesting sound of its own. 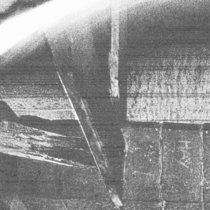 Mark Browne gives us than this magical title ‘ The Collapse of the Hideous and the Obscure’ and fills it up with what sounds like a strange sound improvisation using perhaps the inside frame of a bicycle wheel, a birdcage, a drumkit, or a electric saw? It is a mystery to me but this work of Mark Browne screams with neon colored letters ‘AVANTGARDE’! I love Mark Browne’s sounds and it sounds like Mark Browne loves it too! Humanity on the Wane (Despite Ebbs and Flows)’ is the next work that he presents and its getting more intensive and deep. The strangest things are happening; warm flutes, weird sounds, scratched balloons, aliens? Meditative tools? I think Mark Browne has brought me in some weird wonderland and I can’t seem to find the way out! I start to panic and squeak like a living pig on the table of a butcher! Or .. Wait.. No, nope! This is the last track of Mark Browne. He calls it ‘The Shadows of Dust are Found Wanting’ but to me it’s still a pig screaming! Mark Browne must be an eccentric personality who loves making and playing with sounds." 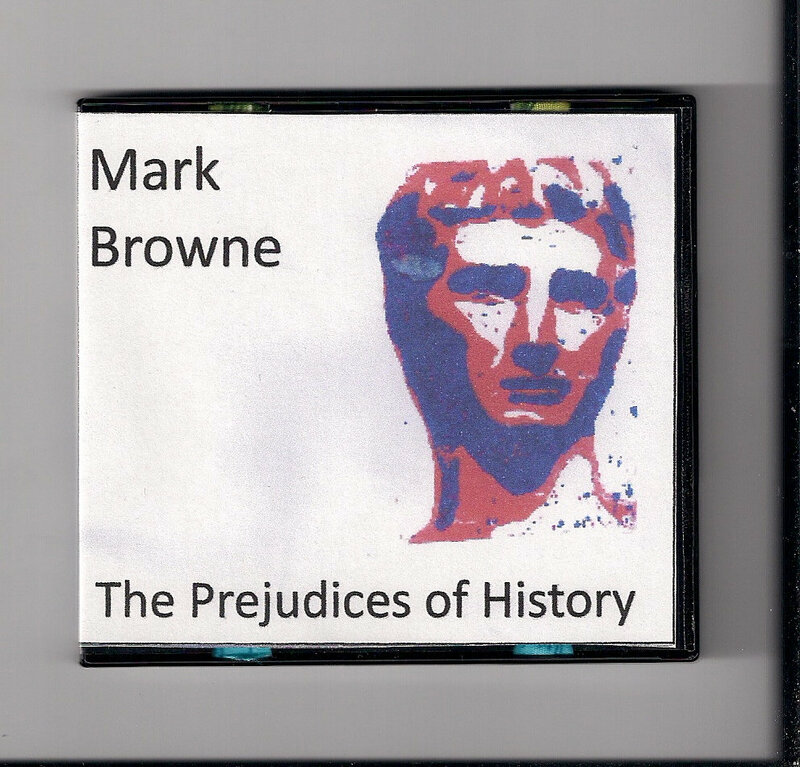 "English player Mark Browne is showcased on The Prejudices of History (LINEAR OBSESSIONAL LOR049), a short mini-CDR of his solo performance which was recorded live in December 2013. Apart from a brief contribution to a Chris Whitehead composition in January 2014, and a 2012 album for the Linear Obsessional label, this Aylesbury player is not often heard from. While he’s mainly a saxophone player, it seems he’s lately been drawn to experimenting with duck calls and whistles, perhaps following trends initiated by John Zorn. The Prejudices of History offers a variety of sounds; where track three is very percussive (lots of splashing cymbals), track four sees him squeezing weird, organic lumps from his woodwind instrument. There’s an endearing home-made quality to his sound, especially when he can do woodwind and percussion in tandem, plus he also bows the guitar and blows the thigh bone (made popular by Coil I believe). 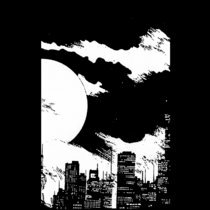 As can be seen, his track titles are quite playful, with a mismatch between the grandiose “sweep of history” proposed by phrases such of ‘The Shadows of Dust are Found Wanting’ and the modest nature of his small, tentative sounds. From 4th February 2014."